Cybernetix is Tim Hart and Warren Phillips. 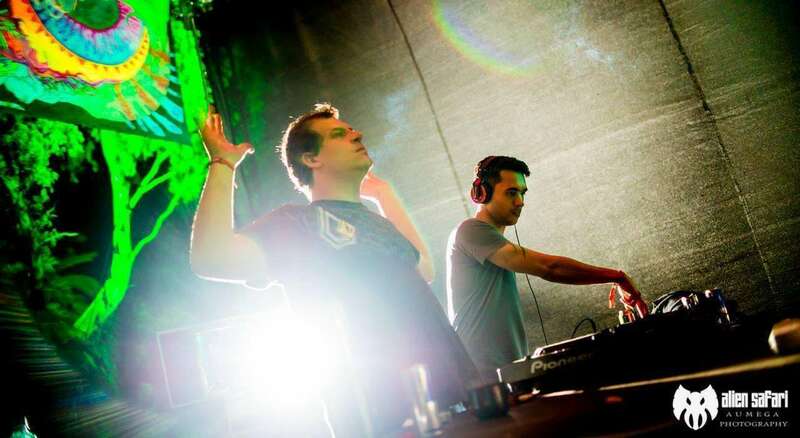 The duo formed in 2008, and have quietly become a formidable force, both for their productions and live sets. With Organik’s The Universe 2013 indoor party kicking off this Saturday and a new album in the works, we briefly chatted to Tim from Cybernetix to see what the dance floor can expect this weekend, plus they decided to throw in a little exclusive mix with some of their latest work! Psymedia : When did the adventures of Cybernetix begin? Cybernetix : We met in 2004 and were both working separately on very basic solo projects, and our music taste was pretty much the same, so we started jamming in Cubase together and found our strengths and weaknesses complimented each other’s production. Psymedia : And what do each of you bring to the project? Cybernetix : Well, Warren does all the visuals and side entertainment in our live sets [laughs]. But, seriously, Warren mostly does the groove leads, fx/percussion and I chip in with leads and melody. We swap the project back and forth until we have a final session where we do the mix and final structure. Psymedia : And you’ve got an album in the works? Cybernetix : Yeah an album is planned. We have 8 tracks done and are in the process of the last track now. But I’ll be honest its pretty slow going as we both are busy with day jobs in the technical event industry. We should have it ready by next summer though. 3 of the tracks in our promo mix will be on it. We’ve been holding back on the single releases to save up for the album. It will also be released on Nexus Media. Psymedia : And we can expect a few collaborations on the album I believe? Cybernetix : Yes a couple of collaborations will be on the album. Iliuchina, Shameless, X-Side and Disco Volante will be on it. Collaborating with locals and internationals is pretty much the same except the project gets delivered to your door with a local, and you have to download it when working with an international. Psymedia : Do you feel like a label is still the right direction, considering how long it takes just to write it? Cybernetix : We started last year and some of the tracks that were meant to be on will probably not make it any more or have to change. Yes, a label is definitely the right way to go still as you can’t distribute on ur own. Even today where digital is at the forefront. Psymedia : And how did you team up with Organik Media? Cybernetix : We met Warren Boysen when he was throwing parties at the old Roots Club in Obs, and he gave us a chance to play our stuff out. We’ve gotten better as his parties have grown, and moved outdoors. Psymedia : How has technology has evolved your studio and live setup? Cybernetix : Well as VST’s get more analogue in their sound reproduction, its gives you access to a whole lot more quality instead of one or two synths. With the advent of the iPad, control systems live Touch OSC, your live set has a lot more flexibility. It was also very expensive to have a decent studio 10 years ago. Now VSTs and apps and DJ controllers have made it very accessible. We still like to keep it old school with CD-Js and hardware! Psymedia : How might this winter season and next summer season differ from the year before? Cybernetix : I think there will be even more parties! With more international acts touring here. There’s not a free date in the calendar anymore and it’s inevitable that we are going to have promoters holding their events in the same day. We could discuss the pros and cons of that for ages.. But I’d rather not get involved in that one! Psymedia : Thanks for the interview! Check you at Organik’s The Universe 2013. Any last words before we finish off? Cybernetix : We hope to see everyone on the dance floor for what promises to be a really sick party! Looking forward to playing a closing set again.